I can hear all the dyed in the wool veteran landscape photographers out there saying, “Who made you the authority on landscape photography in the Canadian Rockies!! !” LOL, well, nobody really. But, this blog article goes a long way towards helping visiting photographers to not waste their time in the Canadian Rockies. How do I know this, and WHAT DOES qualify me to boldly suggest such a list? I think that after more than twenty years living and working as a professional landscape photographer in the Canadian Rockies I’ve learned a few things. The lessons that I’ve learned that I’m sharing here will probably help visiting photographers to make the most of their time visiting the area. I literally know of many dozens of top notch locations throughout the Rockies, both beside the road and a few days travel into the backcountry away from the roads. The Canadian Rockies are my home and they’ve become part of who I am. And, now I want to share just a few of want I think are some of the best roadside winter landscape photography locations in Banff National Park. Vermillion Lakes has become World famous over the past decade for the quality of it’s landscape photography compositions. And for good reason too. This place is A-MAZING! I must admit that I feel very fortunate to live about a 5 minute drive from this incredible location. It’s one of my go-to locations when I’m looking for a beautiful Sunrise to photograph. I keep going back here not only because it’s incredibly beautiful, but I keep going back because I feel that I still haven’t quite captured the absolutely perfect landscape photograph that I have pre visualized in my mind. 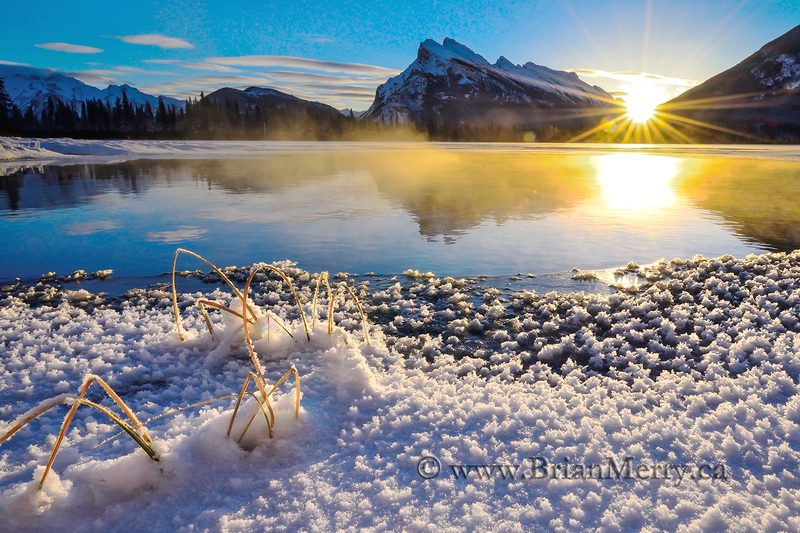 Around the Winter Solstice the Sun rises from the valley between Mount Rundle, left of the Sun, and Sulphur Mountain, right of the Sun while standing at Second Vermillion Lake. You can see this position position in the photograph pictured above. This composition is something I started calling “The Rundle Diamond” back in 2012. I believe that this is a composition that I happened to popularized with this image that I captured that very cold boxing day morning in 2012. This photograph has won multiple awards from the Professional Photographers of Canada at both the Alberta Provincial and Canadian National levels. You should probably add Vermillion Lakes to your personal hit list for landscape photography locations to visit while you’re in the Canadian Rockies. 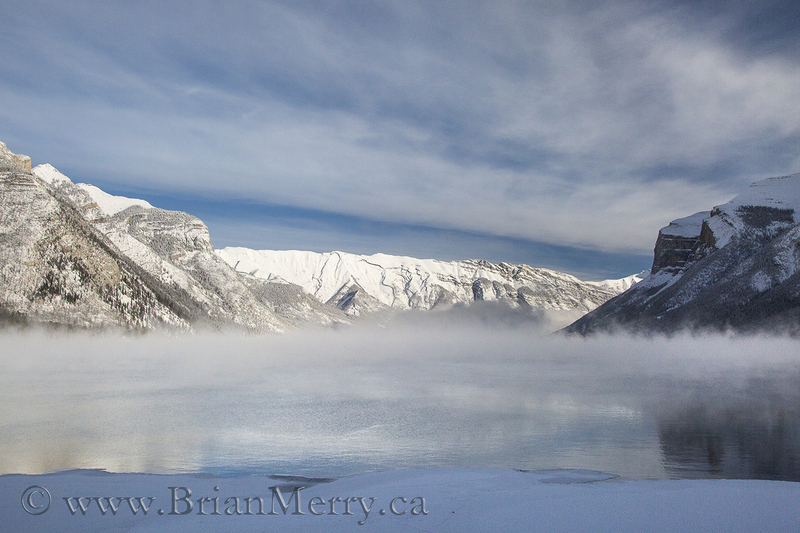 The are many great locations to shoot along the lakeshore of the 3 vermillion lakes right beside the road. There’s also a good chance that you’ll see me drive up to Second Vermillion Lake Sunrise too, if you happen to be there one morning in the future. I love shooting here. Walk over to say hi if you see me pull up in my blue Toyota Prius with my website written on my back bumper. I’ll be the photographer standing there with a coffee mug in hand! Lake Minnewanka has become famous in the last ten years or so due to its proximity to Banff and it’s convenient location to looking NE towards a Dark Sky. This is a perfect location to view the Aurora. 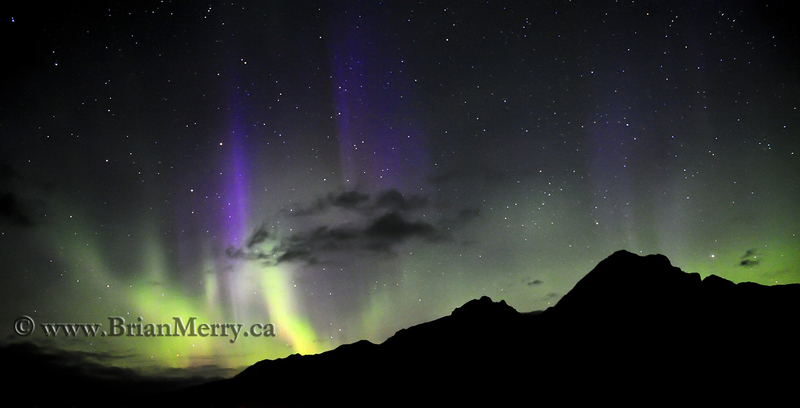 It’s probably one of the best, and is definitely the most popular night sky photography location in the Canadian Rockies. Keep an eye on the aurora forecast and sign up to receive Aurora email alerts on your phone to help you to judge when the aurora might be out. If the aurora is out, and the skies are clear, you won’t be disappointed with this location. It’s also a pretty good spot during the day too, especially when storm clouds are clearing off of the middle ground mountains. It is simply beautiful here. Moose Meadows has many faces to reveal to the frequent Winter visitor. The seemingly infinite combination of snow density on the ground and bushes, along with the endless weather combinations, never seem to disappoint the open minded landscape photographer. This is one of my “bad weather” backup locations that always seems to deliver the goods. Sometimes, when snow squalls sweep across the meadows a beautiful ghostly variable depth of field can develop. Trees positioned at various distances away from the car pullout seem to fade off and disappear behind the falling or blowing snow. Crystal clear days also create good landscape photography conditions here as the layered mountain landscape adds dramatic visual depth to images that will be hard not to capture in your photographs. This seemly unimpressive location was overlooked for decades when I first arrived in Banff in 1996. But, I always kept this location in my “back pocket” as a safe location to shoot in bad weather. 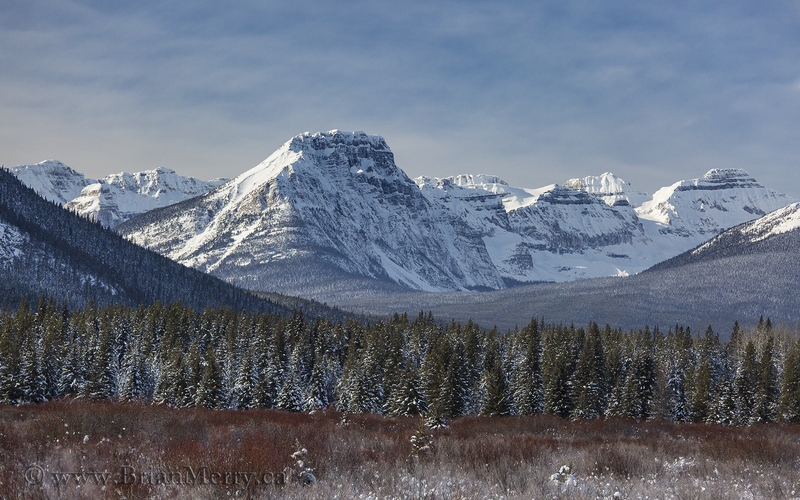 Moose Meadows never seems to disappoint the open minded landscape photographer as this photograph suggests. Moose Meadows is simply beautiful. Check it out! Yeah, I had to include this place too. It is Famous around the World for is simply perfect composition. I should give you one valuable piece of advice for you to remember when composing this scene though. Don’t include too much of Fairview Mountain in your frame when shooting here. Fairview is the mountain in the foreground, on your left when standing on the lakeshore close to the parking lot. The big dark triangle that it forms is a dominating and distracting picture element that completes against the beautiful distant background scenery formed by the spectacularly glaciated Mount Victoria. This last one is often overlooked because it involves an easy 2 hour return hike from your car. Because of the time commitment involved to hike to the summit of Tunnel Mountain many people simply don’t go here. This is one location in the Canadian Rockies that is usually better to shoot in the middle of the day rather than at Sunrise or Sunset. 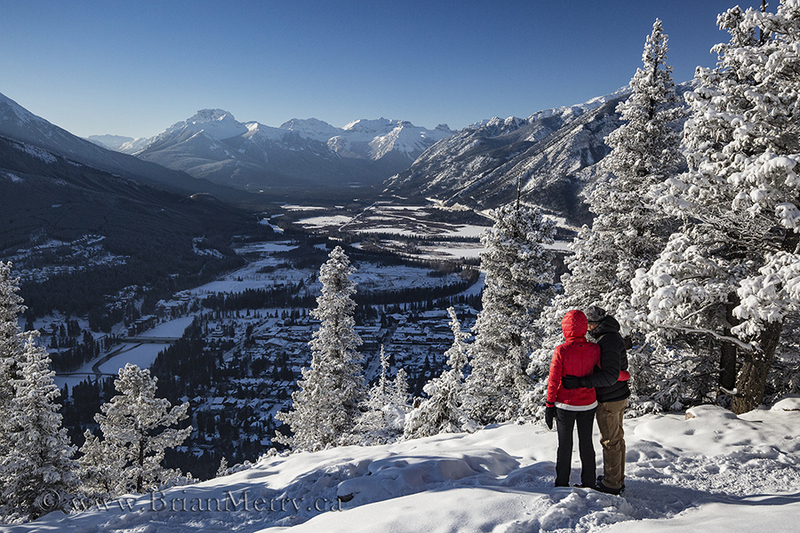 Check it out if you ever have a few hours to kill when you’re in the town of Banff. You can get directions on where the trailhead is at the National Park Visitor Centre on Banff Avenue in the middle of town. They can give you a free map and a good description of the hike. And, don’t worry about being alone on this trail. It is a popular trail and a bit of a local’s favourite. You’ll meet many dozens of people on the trail while you’re hiking it. Locals also like to go hike it too for a bit of exercise or to kill a bit of time. 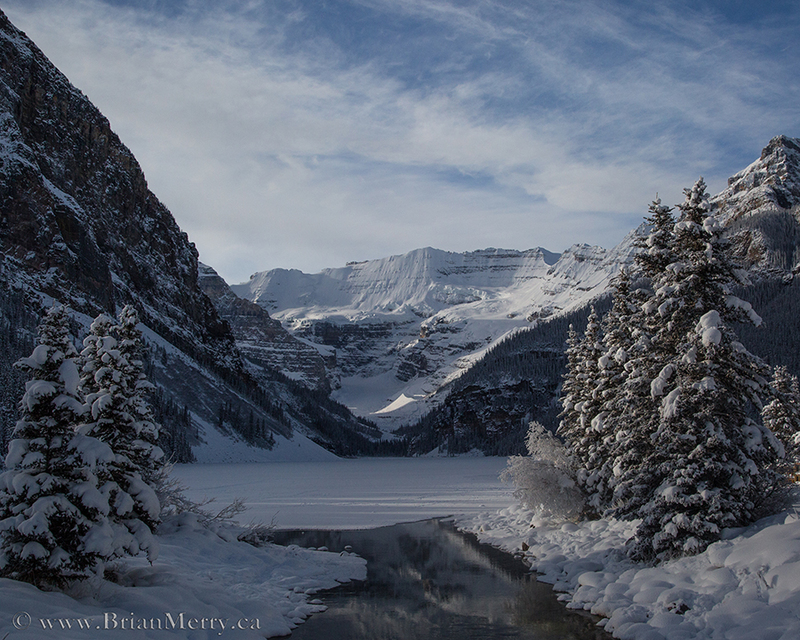 The collection of landscape photography locations I outlined above are among the best Winter roadside locations to shoot in Banff National Park between Banff and Lake Louise. I hope that you get to see and photograph them in good light someday soon. Stay tuned to my blog and sign up for my newsletter too because I’m going to publish an article highlighting the best Summer Landscape Photography Locations in the Canadian Rockies in the near future. These two articles together should give you a good start planning your perfect trip to the Canadian Rockies. And, if you would like to visit what most local photographs consider the “Jewel of the Canadian Rockies,” Lake O’Hara, then check out my annual overnight backcountry there. This all inclusive trip, the Fall colors group tour to Lake O’Hara happens during the usual peak of the Fall yellow larch trees in the alpine around September 15-25th each year. This is one of the best, if not the best landscape photography tour in Canada. Lake O’Hara’s reputation as simply THE BEST place to hike and photograph in the Canadian Rockies in the Fall is well deserved! One last thing. Check it out and feel free to contact me for a private outdoor photography tour in the Canadian Rockies too while you’re here too. Consider hiring me early in your multi-day trip to the Rockies. I’ll give you lots of good advice during our tour that’ll likely help you to improve the quality of your photography for the duration of your stay. I do love sharing my passion and my intimate local knowledge of the area.